Building a nest for red-tailed hawks is relatively simple. It's not a nest per se, but rather a platform. The good news is that someone with basic carpentry skills can usually manage to erect a decent platform. The tough part is placing the nest high enough to entice hawks to use it. The red-tailed hawk, Buteo jamaicensis, ranges throughout North and Central America. It's known as the chicken hawk, because this midsize bird of prey often feeds on domestic fowl, but the bird's primary diet consists of small rodents. Their reddish-brown tails easily identifies this type of raptor. Protected by federal and state laws, red-tailed hawks can't be hunted or have their nesting areas disturbed. Hawks living in cold climates head south for the winter, flying north again in the spring to breed. Those living in warm climates stay put year-round. 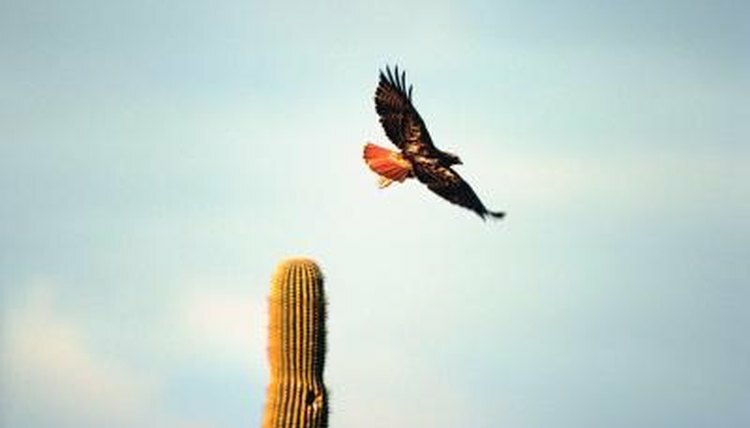 In nature, red-tailed hawks construct nests in large trees or on a cliff, in locations near a water source. The male and female work together to create the nest out of twigs and sticks, lining it with bark and various plant materials. Nest building is a continuous enterprise -- it can reach heights of 3 feet or more. Females lay eggs in early spring, with the young hatching approximately a month later. The male hunts for food while his mate cares for the babies. Fledglings leave the nest between the ages of 3 to 4 months, although some might stick around as long as six months. A hawk's nesting platform should measure 2 feet square. To build this platform, you'll need to cut nine pine 2-by-4-inches wide, 2-foot long lumber pieces. Before screwing the pieces of wood together, drill the holes first. Use a countersink drill bit so that the heads of the screws will be flush when fixed. Fasten the pieces together with corrosion-resistant screws. Cover the screw heads with wood filler. While the platform boards must be spaced evenly, leave gaps in between them so hawks can insert nesting materials there. On the underside of the platform, place joists designed for the mounting structure. Building a red-tailed hawk's nest is a task that can be accomplished by amateurs, but correctly situating it is another story. Because it must be installed at a considerable height, you might want to contact a professional for this task. Place the platform 14 feet or higher on a sturdy base structure located at the edge of a forest or near a tree line. Once settled in, expect the monogamous breeding pair to return year after year. Cascade Raptor Center: Backyard Raptor Feeding?